Gronkowski told "The Tonight Show Starring Jimmy Fallon" the can drew blood, and he showed Fallon the small cut it left near one of his eyebrows. Tom Brady's daughter Vivian was almost hit by a can during Tuesday's parade. The moment was captured on video, showing Brady catching the can after it narrowly missed his daughter. Police said they received no reports of anyone throwing a can at the duck boat. Boston police said 14 people were arrested at the championship parade. Many of those arrested were juveniles and the majority of the charges were alcohol-related. Five of those arrested were involved in a brawl near the end of the parade route. 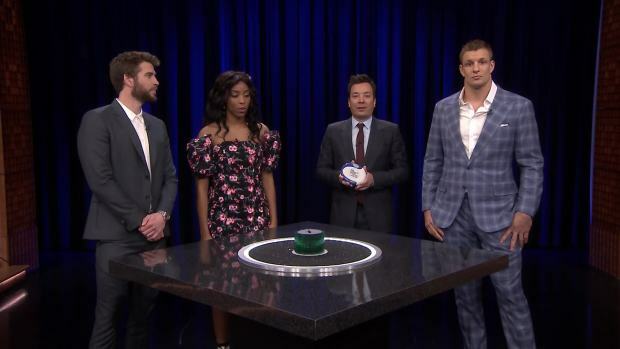 Jimmy Fallon plays catchphrase with Liam Hemsworth, Rob Gronkowski and Jessica Williams.